Artist in residence Hanna Vogel will present her work publicly three times during her stay at Furman. All presentations are in the Roe Art Building and are free and open to the public. You are more likely to be thinking of thread than clay when you approach Hanna Vogel’s art. Vogel, a sculptor, is an artist in residence at Furman for six weeks this spring. 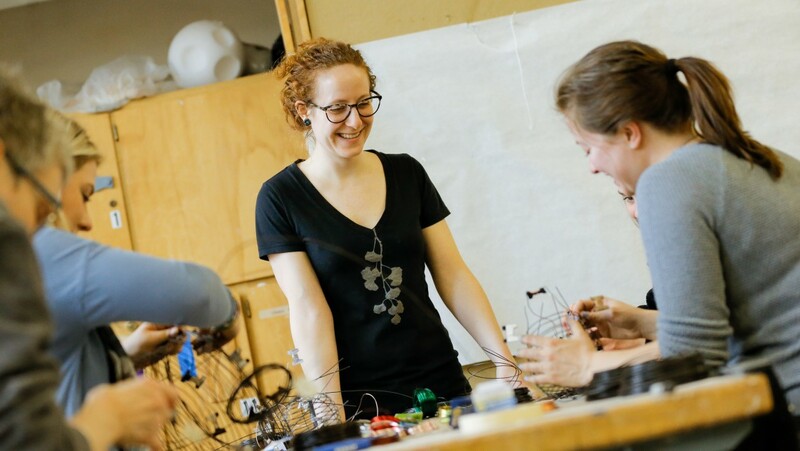 In a studio behind the Roe Art Building, she is creating the individual components – both light-looking and light in your hand – that will form a larger sculpture when she installs them with the help of steel supports. Her creative process presents a unique learning experience for the university’s art students, who have opportunities to watch and learn both formally and informally throughout Vogel’s residency. Vogel loves the contradiction of working with clay to create art that radiates fragility and precariousness. Chance said her work is a far cry from the typical vessel pieces created in a ceramics class. “It’s great having the students get a different perspective on working with the material,” he said. Vogel, a native Californian who works now in Philadelphia, was intrigued by the opportunity to come farther south than she had ever been. She drove to Greenville in a hatchback loaded with 500 pounds of paper clay, which literally has paper pulp mixed in with the porcelain. The additive gives strength as she forms delicate coiled structures with spaghetti-like strands. It allows the coils to support each other’s weight until they are hardened by firing in the kiln. While faculty members often create pieces that are tied specifically to class themes or units, a visiting artist can demonstrate a more personal process. Putting a working artist directly in front of students gives them another potential view of their future. They see the work ethic required to create and install an original piece in a matter of weeks. And her entire process is on display for inspection and instruction. “Students can walk down to the other end of the art building and visit her studio while she’s working,” Chance said. Vogel is the third artist brought in for a residency like this. Previously, the department hosted a graphic artist from Holland and a New Orleans artist who created mixed media sculptures from found objects. The variety of the visitors’ work has provided unique learning experiences for students, Chance said. For her part, Vogel is delighted to be back within easy distance of a kiln, something she has missed since finishing her own education. Her high-ceilinged studio is flooded with light, perfectly conducive to exploring ideas with her delicate strands of clay. “It’s very personally easy for me to just get lost in that,” she said.